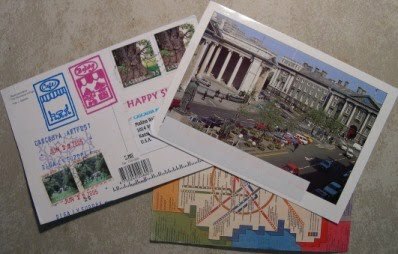 Today, using templates from Publisher, you're going to create a postcard from the place on the planet you'd most like to visit/live/do the Macarena. On the front of your postcard you should have a picture/photo from the location. Make sure they're public domain or creative commons licensed. You can be creative about your location. Maybe you're in a circus, or under the water in an aquarium. With the skills some of you have acquired in Gimp, you could put yourself or someone else just about in any crazy scene possible. Have some fun putting together some slightly incongruous elements in your picture. There should be a mention somewhere on the front of where the picture represents. Be sure to choose a suitable font in a suitable color. A font and color for city like Las Vegas would be quite different from one for a research station in Antartica. On the back of the postcard you should have a short description of the location (a sentence or two at most). It sometimes appears on the bottom left, too. On the back you need to leave a space for an address. This appears on the right, towards the bottom. There should be enough room for a stamp. This appears on the right, towards the top. There should be room left over for message to the person receiving the postcard. This is on the left side. Have fun with this. You can be really creative, and even silly, if you choose to be. After all, would you like to be under the sea in an octopus's garden in the shade? Or maybe you all live in a yellow submarine? Have fun with it, but always, always, always remain tasteful.